HTC may not be the first smartphone maker on people's lips these days, but it's just announced a pair of cracking-looking phones - the HTC U Ultra and HTC U Play. Pricing is to be confirmed and the HTC U Ultra release date is February. The 5.7-inch, 170g HTC U Ultra is most interesting due to a second screen at the top of the phone. The idea is that this can deliver notifications without interrupting what else you're doing. It also - apparently thanks to bespoke AI tech called Sense Companion. This "delivers the right messages when you need them". So your priority contacts and favourite apps will get their info onto this screen while other, less important, stuff may not. It can also help you to receive more power from your phone by learning from your usage. Both devices feature a front-facing camera that switches from 16MP high resolution images to a 4MP ultra pixel mode – meaning you get the best shots whatever the light. There's also a panorama mode. What else? It's powered by Qualcomm's Snapdragon 821 from the middle of last year and is available in 64GB and 128GB versions. HTC reckons its 'durable liquid surface coloured glass design' looks good from every angle and is a result of two years of development. There are four microphones for better voice recognition. The 128GB edition of the HTC U Ultra comes with sapphire Front Glass for even better durability. Android 7.0 Nougat is the OS, with HTC Sense UI overlay on top. And the best named thing in the whole tech world - HTC Boomsound - is back and provides "pulse-pounding audio" - we'll reserve judgement on that until we review it! 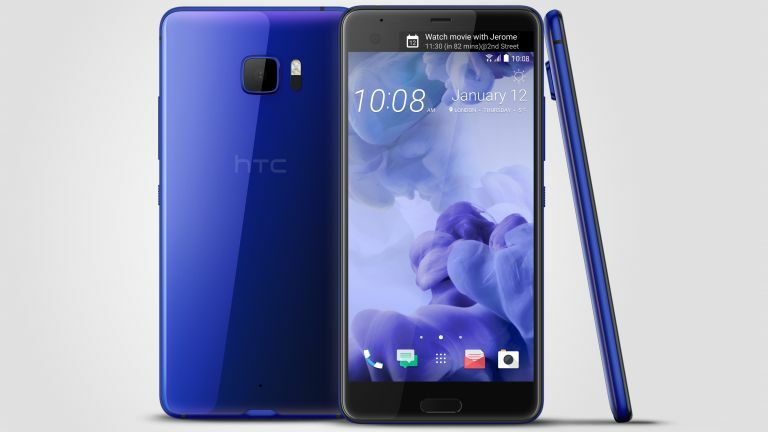 In the UK, the HTC U Ultra and HTC U Play will be available to buy through Carphone Warehouse in a range of colours. You can pre-order from today. They will also be available online from HTC.com, Amazon, Very.co.uk and other leading retailers.